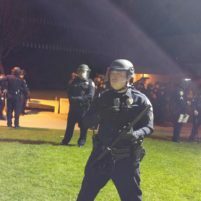 Policing and providing security for the recent fake news forum featuring controversial conservative Milo Yiannopoulos cost Cal Poly and the California State University system a combined estimate total of $86,200, Cal Poly officials say. Cal Poly’s share of the cost amounted to about $46,600, while the CSU covered about $39,600 of the bill. The expenses included providing food and lodging for several dozen officers brought to the San Luis Obispo campus specifically for the April 26 event. In all, there were 129 officers standing guard on campus. The law enforcement presence consisted of 17 university police officers, 54 officers from other CSU campuses and 58 officers from various agencies around SLO County. Additionally, paramedics were stationed on campus during the fake news forum. As was the case with a previous Milo Yiannoupoulos event held at Cal Poly in Jan. 2017, last week’s forum proceeded peacefully. This time, as an extra security measure, officials fenced off the Mott Athletic Center, where the fake news forum took place. Protesters stood outside the fencing with signs, while other critics of Yiannopoulos boycotted the event, choosing instead to hold potlucks or other gatherings. Yiannopoulos was joined last week at Cal Poly by YouTubers Carl Benjamin, commonly known as Sargon of Akkad, and Austin Fletcher, also known as Fleccas. The event followed an aborted fake news panel discussion that was slated to take place in February but was canceled after uproar over the alleged racism of one of the scheduled participants. The Cal Poly College Republicans and the Cal Poly chapter of Turning Point USA co-sponsored the fake news panel. You all have it backwards. If there were no liberal/democrats obsessed with violence and hateful activitys for those who freely express their opinions there would be no need to spend a dime on security. Attendees pay to see somebody they like and money is made selling tickets. It’s that simple and straight forward. You’re blaming Milo for the hate and hypocrisy of the left. My tax dollars are being stolen from me by a bunch of big mouthed children who can contain their emotions. This is not an education, its a waste of tax payer funds. So your mad at the students for protesting…. peacefully? For protesting peacefully the first time and then the second time? Believe it or not the people protesting are expressing their opinion as well and they have every right to do so. Mad no, but If the perps were protesting peacefully without threats of violence to Milo or any other attendees then they wouldn’t need to spend $85K on security now would they Gregory?? $86,000 is quite a chunk of change to protect trash talk from a sleezy Brit. Maybe we need to find a way to make the trouble makers pay the bill? How about some hefty fines for rioting? Overtime and free food. I am sure they also paid travel and per diem lodging a the Quality Suites for the CSU police from outside of the area. What’s a little government waste among friends? $86,200 is considerably more than MANY Cal Poly staff (not faculty or administrators) earn in a year. Safety and security are critical but so are the Cal Poly staff who support all the day-to-day operations. but it is also about what Cal Poly President Armstrong makes in about 3 weeks, just tells me many at cal Poly make way too much. Freedom of Speech comes at a high cost these days until you march to the beat of the right drum. It is the duty to protect freedom of speech for everyone. This was a bargain considering all the damage, injuries and lawsuits filed in Berkeley when Antifa attacked speakers up there. Just the cost of doing business with your tax dollar. Cheap compared to other ventures that they get into.